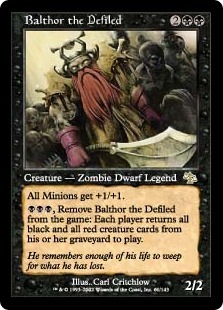 Finally got a card order last week so I could finish off my build of a Balthor, the Defiled EDH deck. I went with a zombie tribal theme, so much so that all of my creatures are zombies in one form or another. I know a lot of others use utility cards and other creatures to support them but I chose not to do that. It could work against me, but I have my hopes. I am also lacking a lot of the standard acceleration items for it and other staples. Not because I don't have them physically, but more because I don't think they necessarily fit the theme I had going. I can always throw them in later, but I want to see how it fares first. I am very creature heavy though so I might end up cutting some in favor of some equipment or more spells. It was hard finding spells that fit what I wanted to do and were cheap, too. I wouldn't mind blowing a fat wad of cash if I had lots of expendable income, but I don't, so even something like 10 bucks a card is a little pricey for me. I'll have a full list posted sometime soon. No time now. Then I'll ask for some suggestions. I'm happy with it and can't wait to test it out. My bro is coming up this week so maybe we can try some EDH games, though I'm not looking forward to trying to shuffle 100 sleeved cards. Yikes.